One of the perks of having young children is that I get to visit the museum at least once a year. On our last trip, after spending a fair chunk of the afternoon looking at dinosaur bones and the reptile display, I managed to steer my hubby and kids towards a new exhibition on the human body. While the rest of the family got caught up looking at replicas of the human skeleton, I walked ahead and found myself in a darkened room with a display on the human brain and mental illness. Now, here I should stop and mention that despite having been diagnosed with bipolar disorder, I have never read anything on the history of mental illness. I really had no idea what life was like for people with a mental illness 20, 50 or even 100 years ago. And so I found myself absorbed in what I was reading: stories of people sent to mental asylums – sometimes never to be released – and people forced to endure barbaric procedures like partial labotomies – in an effort to fix their depression. At the centre of the display was what looked like a wooden cupboard, with a small hatch for passing food through. Turns out this was a form of solitary confinement in the asylums – used for locking up people experiencing manic episodes or deemed uncontrollable. Standing there – I felt shocked to my core. Is this what would have happened to me – or others I know with a mental illness – had we been born 50 years ago? Not once had I stopped to give thanks for the wide range of medication and treatments that are available today for those with mental illness. Medication that makes it possible for me to live a normal life – to be a wife, a mother and a valued employee. Sure, I’ve had some bad experiences – and there’s still a long way to go in understanding and treating mental illnesses. But at least things are headed in the right direction. And I’m no longer at risk of having half my brain removed in an effort to treat a depressive episode. 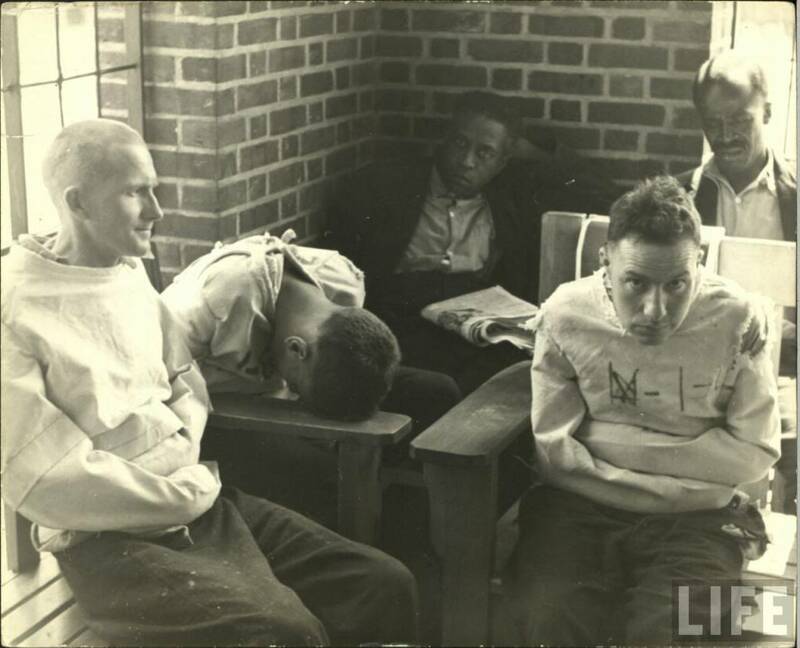 Patients at an insane asylum in the 1950’s. Many of us have been through hard times. And it’s only natural when we’re hurt to want to revisit the source of that hurt, time and time again. After I was subject to humiliating treatment by carers in a public psychiatric ward, I found it hard to forgive. I came out of hospital with all sorts of plans for how I would get revenge – wanting to sue the hospital or let the media know what went on inside the walls of the locked ward of that hospital. My family convinced me this wasn’t appropriate – that that the staff were only doing their (very hard) job. But I felt let down by the medical profession, and angry that carers and nurses could have treated me so brutally. Eventually, I stopped ranting and raving about their behaviour toward me and other patients. But to be honest, it was only years later that I found it within myself to forgive them. Those carers will never know that I’ve forgiven them. But I knew that I needed to forgive them anyway. We all know bitter people. They’re the ones that no one really enjoys being around because they wallow in self-pity and seem to constantly go on about every little thing that has ever happened to them. Like a cancerous cell or a dangerous mould spore, bitterness thrives in the dark recesses of our hearts and feeds on every new thought or spite or hatred that comes our way. And like an ulcer aggravated by worry, or a heart condition made worse by stress, it can be physically and emotionally debilitating. I admit that I struggled with feelings of bitterness about what had happened to me in the psychiatric ward. I felt that the horror of my experience somehow ‘exempt’ me from the need to forgive. But something within me knew that I needed to forgive. Unforgiveness eats away at us until it spills out and corrodes everything around. And so, I dropped thoughts of revenge and I forgave. While forgiving didn’t take away my pain entirely, it kept me from being sucked down into the downward spiral of resentment. Once you are able to let go of wrongs that have been done to you, it changes everything. It will change your relationships, your attitudes and your whole approach to living. Forgiving isn’t a sign of weakness. It’s a sign of strength. Have you ever struggled with feelings of bitterness? Have you ever had to forgive people in the medical profession, or friends and family, for the way they have treated you while you were unwell?